Sour Caramel is autoflowering medical cross bred for pain relief. 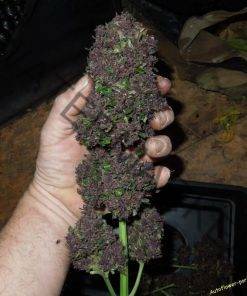 Plants from this cross during testing have shown a varied array of colours: from red, blue through to the dark purple and black. Sour Caramel is a third generation medical cross breed for pain relief. Plants from this cross during testing have shown a varied array of colours: from red, blue through to the dark purple and black. Growth Pattern: Sour Caramel is medium heigh plant with open structure and multiple lateral branches. Aroma/Smell: Sour, Fuel, Chocolate, Caramel, Coffee, Sweet, Fruity. Effect: More suitable for evening/night medicine. Medical benefits: A nice all round med good pain relief, relaxing but in no way couch lock, stress relief, sleep aid.